This month's climate summary highlights the warm weather and diminishing drought during February, plus the CoCoRaHS March Madness contest that's now underway. A wave of warmth swept in during February, and the statewide average temperature of 50.51°F -- nearly 8 degrees above the 1981 to 2010 average -- ranked as our 2nd-warmest February on record dating back to 1895. The only warmer February in North Carolina occurred back in 1927. 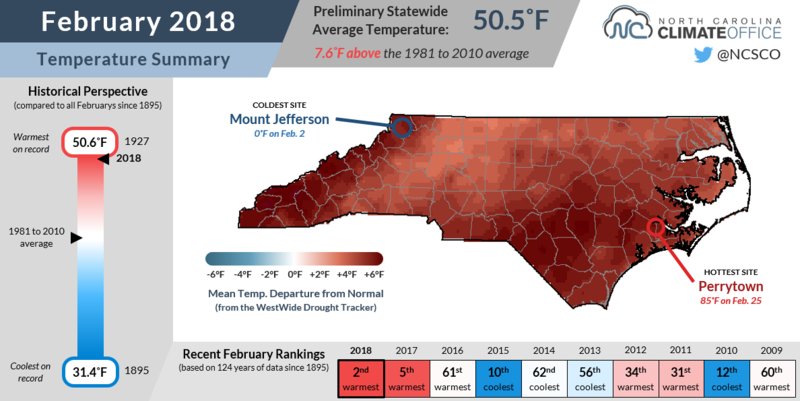 Many stations around the state recorded their warmest February, including Charlotte (warmest out of the past 138 years), Asheville (warmest out of the past 127 years), and Elizabeth City (warmest in 83 years). Even for sites that didn't set records, the past month's average temperatures ranked as one of the top five warmest at most locations. Those high rankings were due to both above-normal maximum and minimum temperatures. Highs peaked in the low 80s across much of the state on February 16, setting new daily records. In Charlotte and Shelby, that day's high of 82°F tied the record for the warmest ever February temperature at both sites. Meanwhile, low temperatures at most stations ran 8 to 12 degrees above normal, and the eastern half of the state went the final 19 days of the month without dropping below freezing. It was certainly a big difference from our early January pattern in which we had a tough time getting above freezing. In both cases, a persistent jet stream helped lock us in to several weeks of warm or cold weather. 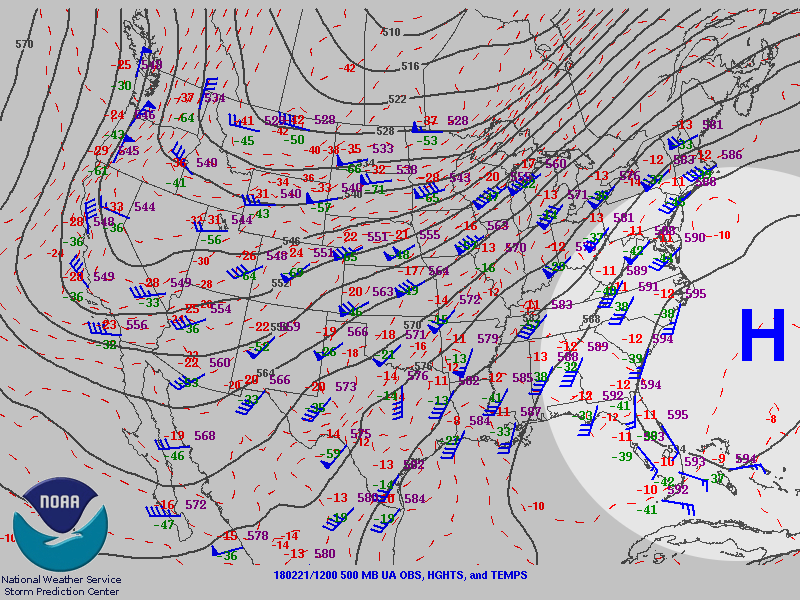 For much of February, the main trough in the jet stream was off to our west, which allowed a strong Bermuda high pressure system to build off the southeast coast and reach an impressive -- and perhaps unprecedented -- strength for this time of the year. The warm pattern was similar to last February, which also ranked among the top five warmest on record. However, a good lesson to take from last year is that despite the early start to spring, freeze events are still likely for at least another month. Last year, an early April freeze damaged 43% of winter wheat crops in the state. 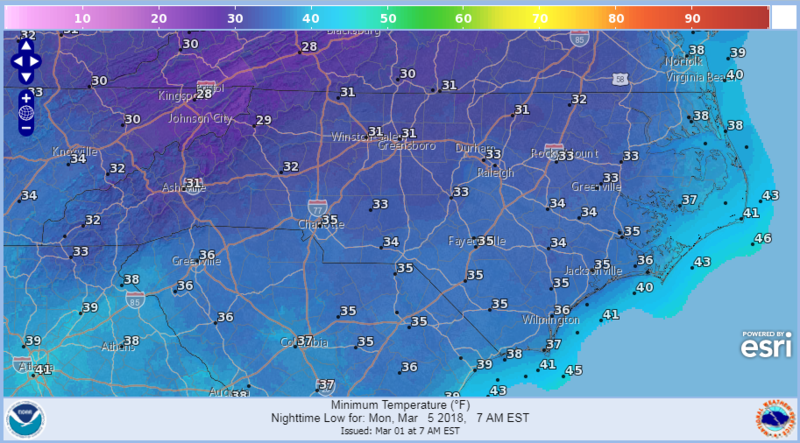 Current forecasts show lows dropping below freezing early next week, and that probably won't be the last time we see sub-freezing temperatures this spring. While February was warm all across the state, our precipitation had a more mixed pattern. Overall, the statewide average precipitation of 3.87 inches was near-normal, ranking as the 61st-wettest February in the past 124 years. It was a wet month in the Mountains, with many locations receiving two or more inches above their normal precipitation. Highlands picked up 12.39 inches of precipitation last month, which was 5.5 inches above normal. Those heavy rains in the Mountains were balanced out by dry conditions in the Piedmont and Coastal Plain, where many locations were up to 2 inches below normal. With just 1.3 inches of rain all month, New Bern had its 3rd-driest February on record. Despite the slightly dry weather in some spots, we did see drought improvement during the month due to the lingering effects of January's snow and rain events on streamflows and reservoir levels. 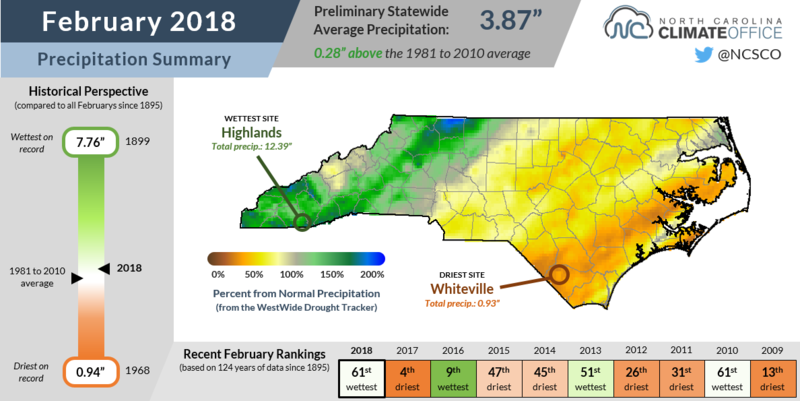 The western Piedmont began the month in Moderate Drought but is now just Abnormally Dry, and only a small sliver of Moderate Drought remains along the Virginia border. Heading into the meteorological spring, we're in pretty good shape, all things considered. 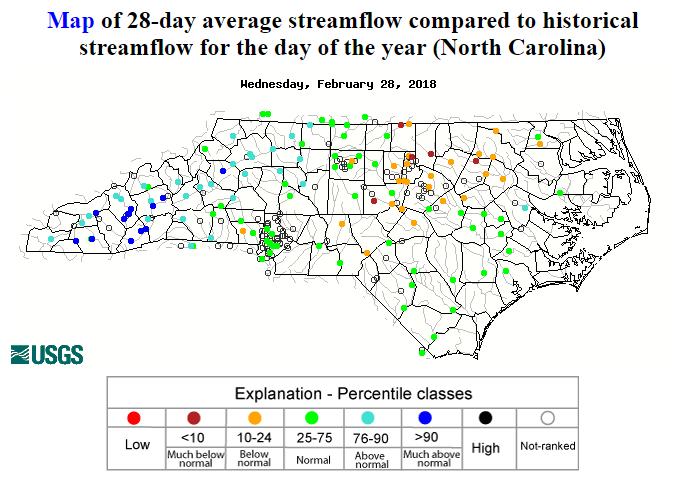 Reservoirs are full, streamflows have generally recovered although some eastern Piedmont sites remain below normal, and light rain events in recent weeks have been enough to keep the soil surface saturated. Some deeper soil moisture levels are still on the dry side, and the recent warm weather has kick-started discussion about water losses due to evapotranspiration. However, given the drought status entering the winter and our fears of a dry, La Niña-dominated season, we made it through in far better shape than we expected. US Drought Monitor maps for North Carolina on January 30 (left) and February 27 (right). As we head into the spring and our precipitation begins to come increasingly from localized showers and storms, we're again reminded of the importance of having precipitation observers across the state. If you're interested in taking and reporting measurements from your backyard, consider joining CoCoRaHS -- a national network of volunteer precipitation observers. In the past, we've covered the stories of CoCoRaHS observers, some extreme totals from various events, and how meteorologists use the data. In case helping with weather monitoring and forecasting isn't enough incentive, if you sign up to be a CoCoRaHS observer this month, you can also help North Carolina reclaim the title in the March Madness contest to see which state can recruit the most new observers. While we're four-time champions, Arizona and Florida have beat us out in the past two years. If you're already an observer, thanks for your daily diligence, and consider submitting weekly Condition Monitoring Reports to further help us monitor conditions across the state. 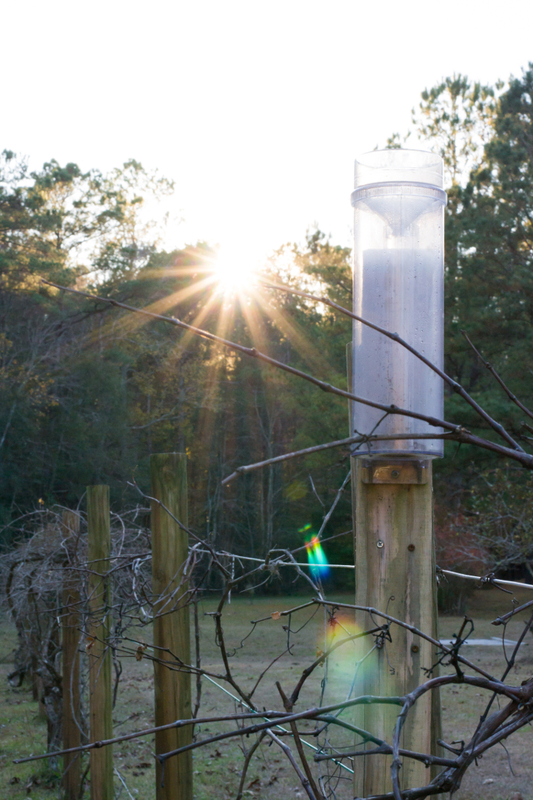 And if you're itching to assist with providing observations, we hope you'll join CoCoRaHS this March!